Are you sure you want to delete this Advert? 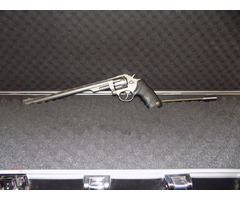 A very good, Taurus long barrel revolver in 22lr, stainless finish, stainless balance bar fitted. Helpful FAQ or YouTube videos on how to use the site to buy and sell on the marketplace and even helpful videos on how to contact your local police once you purchase or make a sale. Subscribe to our newsletter and stay up to date with the latest news, deals and information!